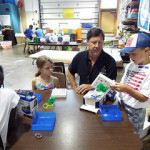 The Walsh Makerspace is now open in a 7,200-acre neighborhood in west Fort Worth, bringing 21st-century technology and tools to its residents and to the public. The 2,000-square-foot makerspace includes a woodshop, computer design software and 3D printers, a laser cutter, robotics lab, and an electronics lab. It also features kid-friendly methods to create and learn with their hands, including a giant Lego Wall and Makey Makey Invention Kit, according to a Walsh release.